The Fiat 500 Abarth is one of our favorite cars around here. It's like a muscley little bulldog, perhaps if Lewis Hamilton's dog was made into a car. Now there's a version with even more manly looks and you could drive it... If you live in Europe. The plan is to run a contest called Make It Your Race across 10 European countries to find drivers, bloggers, designers, and even grid girls. Last year a similar event was held across six countries just for drivers, and they had 30,000 applicants. They expect even more this year. After the application process, a number of smaller challenges will whittle the field down to just 40 people, who will attend a boot camp in Italy. There, seven finalists will be chosen to race in the Trofeo Abarth race at Monza, where only one of them will win. The grand prize is a 500 Abarth. What did you expect? What really interests us is the race car itself. Just look at it. 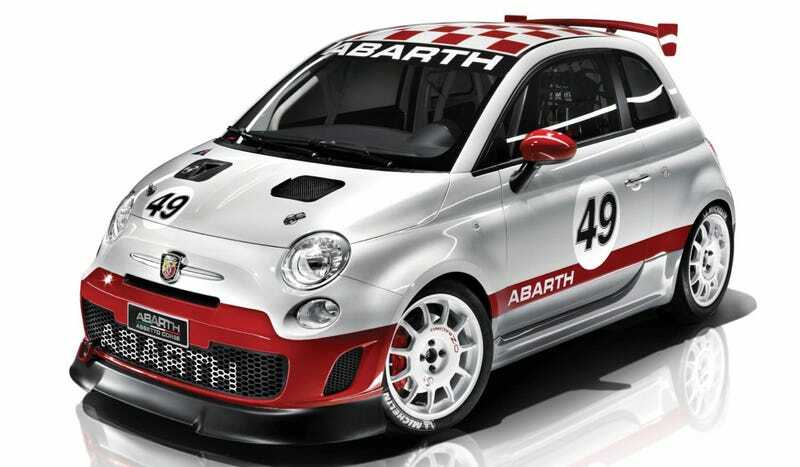 It's all toughened up like the Abarth race cars of old, with wings and big lettering. It just looks fun. Maybe we'll enter just to try and have a go in the car.